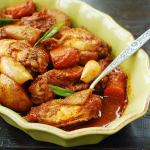 This slow cooker chicken recipe is adapted from my dakjjim (also called jjimdak) recipe. I love the results! I hardly cook it on the stove top anymore. Thanks to my 11-year old Crock-pot, it takes much less effort on my part to make this moist and tender chicken that’s full of flavor. 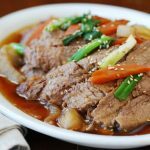 A frequently asked question on my slow cooker recipes is whether any water or broth is needed in addition to the sauce in the recipe. The answer is no! 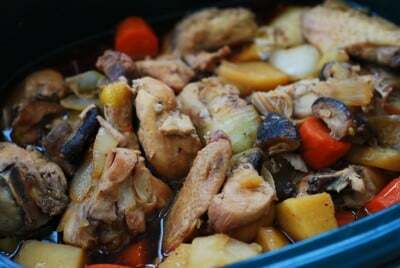 Slow cooking brings out a lot of natural juices from the meat and vegetables with little evaporation. You’ll end up with much more liquid than you started with. 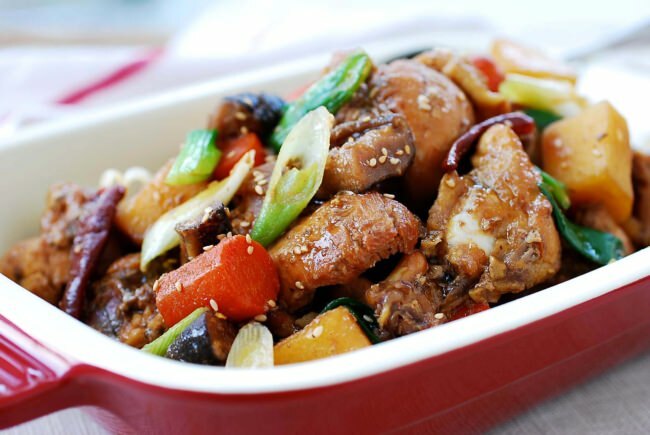 I usually cut up a whole chicken into serving pieces to make dakjjim (닭찜). I love all the different pieces I get from cutting up a whole chicken for rich dishes such as this one. Plus, I get the backbone that I usually freeze to make stock at a later time. What a deal! See how to cut up a whole chicken here. If you’re buying cut-up chicken, bone-in and skin-on thighs and drum sticks will be the best for this recipe because they lend much more juice and flavors to the sauce. 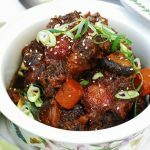 Unlike dakdoritang (닭도리탕), a chicken dish that is cooked in a spicy red sauce, this dakjjim recipe is braised in a sweet and savory sauce. It gets the spicy kick from fresh or dried hot peppers. You can always leave them out if you or your kids don’t care for spicy food. 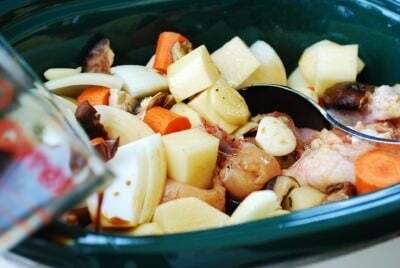 The cooking steps are pretty standard for slow cooker recipes – prepare the ingredients, place them in the slow cooker, and cook either on high or low heat. In this recipe, I added an optional extra step at the end, which I think completes the dish nicely. Pour everything into a large pot and boil over high heat on the stove top, uncovered, for a few minutes, to achieve a slightly thick, glossy sauce. 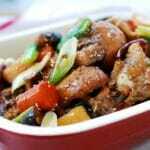 2 tablespoons oyster sauce or 2 more tablespoons soy sauce. Cover, and cook for about 4 hours on high or 6 hours on low. Stir to rotate the chicken over midway through the process, if you’re home. Stir in the scallions, sesame oil, and sesame seeds with a few minutes remaining, or see the optional step below. Transfer to a large pot. Cook, uncovered, over high heat until the liquid is reduced and slightly thickened, 6 to 8 minutes. Stir in the scallions, sesame oil, and sesame seeds. Turn the heat off as soon as the scallions are slightly wilted. How big is your slow cooker? 6 quart. And this recipe fills up to 2/3 to 3/4 of it. Thanks! Yes it would be okay. You might get a little less liquid, so watch the liquid level if you do to the optional step reducing the sauce. Enjoy! 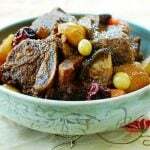 I love the original jjimdak recipe but love using the slow cooker. What would be the best way to add dangmyun to this one? Thank you! You can either add soaked noodles to the slow cooker with about 10 to 15 minutes remaining or to the pot in the optional step with 2 to 3 minutes remaining. The noodles will soak up a lot of water so watch the liquid level. Enjoy! I made this for dinner tonight, and it was easy and delicious!! Thank you for sharing the recipe! Hi Bryony – Happy to hear that! Thank you for letting me know. Wow, another winner. I made this for the family and they love it. I also did what you told “Angie” to do with the noodles. My girls love this with the noodles. Thank you sharing this with us. Hi Sherrie – That’s great to hear! Ah your girls know the noodles soaked in the sauce are delicious.Thank you so much for taking the time to let me know how it turned out! It means a lot to me. Hi Hyosun. This dish was delicious! Thank you for sharing this recipe! That’s great to hear! Thanks! So excited to try this! I shared your website with friends! Thank you so much for spreading words! Hope you enjoy the recipe. Yummos! This was sooo good! The next time I’m going to try this is my electric pressure cooker. Sounds great! Let me know how it turns out. If I wanted to use a pressure cooker, how long would it take to cook? Would I need to adjust the recipe in anyway like using less water or something? I haven’t cooked this in a pressure cooker, but it should be quick and I’d guess about 15 to 20 minutes. This recipe doesn’t have any water because slow cooking produces a lot of liquid. I think the liquid level in this recipe is okay for a pressure cooker, but please come back and let me know if you try it. It would help other readers. Good luck! Thanks for the recipe! I made it last night in my electric pressure cooker. I set it to the default chicken cooking time of 15 minutes (however, note that I have an Instant Pot cooker, which operates at a lower pressure than most pressure cookers. Thus if you are using a different pressure cooker you can probably cook it for even less than 15 minutes) and everything cooked well into a nice stewiness. I followed the recipe and the results were a little watery so I tried to boil some off but got impatient and ended up adding a few tablespoons of cornstarch to thicken. The flavor was great though and my husband loved it; it just didn’t look as pretty as yours! Thank you very much for letting me know how it turned out in the pressure cooker! It seems like the pressure cooker generates a lot of liquid from the ingredients. I’m happy to hear your husband loved it. I accidentally poured in the sesame seeds and sesame oil with everything to cook. Did I just ruin the entire recipe. I’m freaked out now. Hope you still enjoyed the dish. I’m sure it was still good although the sesame oil might have been overpowering. We all have moments like that in the kitchen sometimes. Cheers! I wanted to make this but on the stove top. Is this possible? I saw that for your daktoritang recipe you had a stove top version, can I use the same step for this jjim? Thank you for the recipe! I left out the chilli as I have 2 young children and I just cooked it in a normal pot on a low heat. It tastes just like how my mum used to make it for us. She never used measurements so no matter how many times I tried to make it “by taste” it just wasn’t the same. I will be using this recipe from now on! Is it because of the gluten in the soy sauce? If so, there are gluten free soy sauce out there. Otherwise, it will be difficult to create the flavor of this dish without soy sauce. thanks so much for these wonderful recipes. I was wondering if it would be possible to put it in the slow cooker all day at low while I’m at work, or if it would dry out. Thank you! I’d think 8 to 10 hours on low would be okay if you use larger pieces and bone-in dark meat. And every slow cooker is different. The newer ones cook much faster. Hope you try it. When making chicken broth from the reserved back bones, is it good to make a milky broth the same way as in 설렁탕, or is it better to simmer them on low heat for a clear stock? Depending on what you want to use it for, but generally either one is fine for Korean cooking. 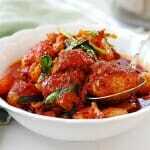 I’ve made many versions of Dak Jim – recipes that I got on the internet. They were good but not quite what I wanted. Yours is perfect! I think the oyster sauce helps too. I was able to get gluten free oyster sauce at the Asian grocery. It’s the Panda brand – green label. I always use GF soy (that’s much easier to find). I am thrilled to hear that! Thanks for letting me know. Now I want to make it again soon. Do you leave the skin on the chicken, or do you remove them? Such a lovely website! Can’t wait to look through your recipes! Cheers! Thank you for the nice words! I leave it on for more flavor, but you can remove if you want. Silly question: Do you cut the chicken off the bone? I was thinking about leaving the pieces bone-in and whole for a little more flavor (and, to be perfectly honest, a little less prep work!). Thank you! Yes, they are bone-in. It will be easier and more flavorful. Thanks for the recipe. I did use Gochujang in my sauce. It turned out so good and spicy. Thank you for sharing this recipe. Can this be done in the oven? I am gonna try it out with my Instant Pot. Thanks! This was a hearty and warming dinner for a subzero winter day. Delicious. Can I use a whole chicken instead of cut up pieces? Can I double it in one slow cooker or at least multiply it by 1.5 to serve more people? Doubling may be too much. I think 1.5 is okay but try to stir a couple of times while cooking. Enjoy! 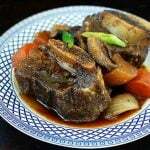 I made your slow cooker beef shank and it turned out great. So now I want to try your chicken recipe. What I would like to know is if turkey can be used in place of chicken? Not Korean traditional, but sure why not. It will still be delicious. 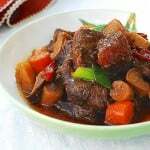 Hi Hyosun.I really enjoy your recipes,especially the recipes designed for the life saver of the kitchen,the Crock Pot,The recipie are easy to understand,and takes all the mystery out of Korean cooking my go to dish is Korean Shortribs.So yummy,my family loves it,and it’s so easy.Thank You! !I bought some brisket,can you suggest a dish?My next dish will be,Korean Braised Chicken,wish me luck!! If you dont have rice wine vinegar or brown sugar.. can you use apple cider vinegar and maeshil?? Also instead of Mirin can White wine be used? Thanks! Yes to both questions! They are always great substitutes in Korean cooking. 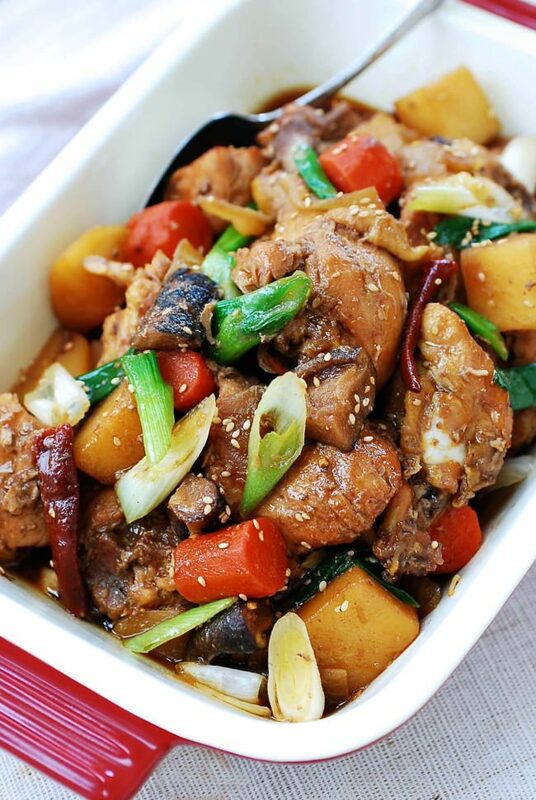 I’m glad to hear you are trying Korean cooking, and this recipe was a guide. Happy Korean cooking!